Health | My Thinking Out Loud! Health – My Thinking Out Loud! How the new Medisave Additional Withdrawal Limit affect your AIA HealthShield? The answer is fortunately, NO! The new AWL actually INCREASE your withdrawal limit which can be used to pay for your AIA HealthShield plans, so you have to pay less cash if you’re nearing retirement or already retired. I’ve done up a new post with Tables showing the before/after of how much you need to top up in cash. Check it out below. Once I get some sleep, I’d update my original Integrated Plans article to include the latest published information from MOH. HFMD, all parents dread these 4 letters & with good reason. It’s the chicken-pox of the 2010s, where your child cannot go to childcare or school and there’s no cure and no vaccine. In Singapore, MOH has declared it endemic and there’s a good chance it’ll infect your kids like it happened to my (then) 4yo daughter. As an insurance professional, I’ve handled many HFMD claims for StarShield babies so far this year (2015) and heard many horror stories regarding the pain & suffering of their toddlers and themselves. My kids are 6 & 5 so I understand their pain and I was somewhat prepared when my 4yo (at that time) daughter got HFMD. So I’m here to share how to be prepared to handle the situation if this happen to your child. Lesions on the mouth & lips. Abrasion from the scratching? Must be super itchy for this to happen! Hand Foot Mouse Disease is caused by 2 different families of virus, and like flu, your immune system is only primed for that particular strain in that particular sub-family. If you’re infected by a different virus strain, your prior infection isn’t going to help you. The symptoms appears 3-4 days after infection and the most common ones are lesions around the joints & mouth, a low level fever and most painful of all, many many ulcers in the mouth. It’s seriously scary to see so many ulcers in your child’s mouth if you’re unprepared so I’d prepare you by showing my daughter’s. 😉 13-14 ulcers in total! Day 2: 4 ulcers on lower lips. Day 2: 4 ulcers under the tongue. Day 2: 1 ulcer on inner left cheek. Day 2: 1 (maybe 2) ulcers to the right of her tonsil. Day 2: 1 ulcer on the left of tonsil, making 2-3 at the back of her mouth. Day 2: 2 ulcers at the gumline of upper jaw. The ulcers are the worse part of the disease. That’ll take about 5-6 days to clear before the doctor can declare your child healthy and non-infectious. HFMD affect different children differently because there’re so many virus that can cause it and these virus particles can survive even when the mucus is dried up. So the best defense against HFMD is to ensure your kids washes their hands before eating anything. Since there’s no vaccine & no treatment available, it’s a waste of time & money to see pediatrician unless your child is below 2 years of age. Just see a normal GP for liquid Paracetamol or acetaminophen to manage the fever & pain from the ulcers. Some GP prefer to prescribe Ibuprofen and that’s fine because it’s more effective as a painkiller, but the dosage MUST be strictly followed because liver damage is a known effect even with a light dosage. This is why I opted for Paracetamol. If you want more detail on HFMD, click here. First of all, don’t worry, most HFMD in Singapore don’t result in death. Hospitalisation may be needed if you can’t manage it properly so I’m here to help you manage it properly! Be prepared to take 1 week leave if you cannot find someone willing to take care of your child. Please don’t ask your parents to take care of your sick child. Elderly has a weaker immune system & if they catch HFMD, they’ll suffer badly! ENFORCE hand washing for everyone at home if you don’t want everyone to be infected! Also, no kissing and reduce touching to minimize the chance of contaminations and increasing the itch to those blisters. DO NOT share food! Always pass the food to the child so that his/her utensils never touches what the rest of the family is eating. Wash your child backside or ensure he/she washes his/her hands after using the toilet because HFMD is passed from feces to the mouth. Prepare some topical (non-steroid) cream to reduce itching. If ulcers becomes bad, prepare plain porridge everyday with some salty or sweet condiments. Everything that goes into the mouth is going to hurt like hell for your child. Sympathise with the pain but ensure your child gets the food down because he/she really needs the nutrients to fight off the infections! (Contrary to many advise, ice cream hurts!) High salt or sugar content hurts the ulcers so plain and warm is good. Use alcohol swaps to wipe down all the child’s regular toys + surfaces he/she touches everyday like door knobs to minimize cross-contamination. Sterilising the whole house is frankly impossible and since HFMD viruses are not air-borne, just ensuring everyone washes their hands before food and you’d be fine. My 6yo son has close contact with his sister but by following our instructions, he never contracted it. My main weapons against the ulcers. Do Not Let your child play in public & spread the virus. Do Not Bring you child to childcare & expect them to take care of your sick kid. Do Not Eat all sort of medicine, western or traditional. It’s not going to help. Just ensure your child is well-fed & hydrated. Do Not Punish the child for not following your instructions or being cranky. Trust me, the ulcers are driving him/her crazy enough. Do Not Overdose your child with painkiller. Do Not Give lots of kisses & hugs. If you go down, it’ll take twice as long for YOU to recover! Then WHO’s going to take care of you & your child? The most painful ulcers are those at the back of the throat & mouth. Those under the tongue will make it hard for your child to eat anything. Give painkiller. Follow dosage carefully especially with Ibuprofen. For very young toddlers, watch out for these side-effects & stop the medication immediately and see your doctor. For Paracetomol or acetaminophen, you can safely increase Paracetomol dosage slightly if needed. If you believe in Watermelon plant powder, you can spray 2-3 times to the back of the tongue. My girl didn’t like it because it’s so bitter. Personally, I prefer the ulcer gel because there’s no restriction on dosage. Clean your hands and carefully apply a dot of ulcer gel on your little finger. Dap or rub the dot on the ulcer. Repeat until you’ve covered all the ulcers. For those ulcers at the back of the throat, I squeeze a liberal amount under my daughter’s tongue and ask her to mix it with saliva, gargle & swallow. If you do all 3, most of the pain will be gone enough for you to feed your child! Since there’s no cure for HFMD, it’s important your child is able to fight off the infection him/herself. This means he/she must eat or at least drink formula milk that can fulfill the daily nutritional needs. Plain, bland, soft & warm food is the best. I found plain porridge is the best for my daughter, together with those Taiwanese mock duck or glutten which is not too strongly flavoured. After a few initial tentatively swallows, my daughter manages to finish her porridge in record time! Just remember to spread the porridge in a big plate so it cools down fast! We’ve tried different food, milo, cold milk & ice-cream. All hurt her badly especially cold stuff. After food, I find that another round of ulcer gel helps to take the edge off the pain enough for her to sleep soundly. For hydration, I found that plain water is the best because the sugar in flavoured beverage hurts the ulcers for a long time. If your toddler is young, you can try to thin the milk a bit if he/she is rejecting the milk. I generally wouldn’t worry about the fever unless your child becomes listless and lethargic, or worse, have a seizure. If you follow the dosage of the painkiller & the fever stays high, quickly seek medical help. By following these rules, my girl recovered nicely with no weight loss or lasting effects. I hope this article helped you if your child got HFMD. Most insurers don’t comprehensively cover all aspects of managing childhood disease like HFMD. Fortunately, I know one that does that. From outpatient GP/Specialist costs, to taking care of the taxi fare or parking fees shall your child be hospitalized, to the actual hospital bill. It’s very affordable to boot. A happy claim for my clients. Errors? Comments? Questions? Use the comment box below! But I digress. There are many ways for people to beat the haze but the best is to stay indoors with the air-con on and all doors & windows closed as tightly as possible. If you have put off installing an air-con in the house, please consider doing so now, as the haze will be with us for many more weeks. Look at my post here on how to choose an air-con suitable to your house in Singapore. Offices are usually the best as the air-cons are maintained by professionals regularly. The air-cons at home, may not be maintained as regularly so do clean them today if you haven’t done so in the last 3 months. I just cleaned mine today & there’re a lot of grey ash on it. Many people are also turning to air purifiers to help clean the air in their home or office and while many of the good ones are effective, they also tend to be noisy ( >60dB on high setting), not to mention they cost many thousands of dollars. Let’s take a look at some that I’ve come across. Air purifiers work by pushing & pulling air through multiple membrane filters. Due to the resistive nature of membrane, the fan motor must be very powerful in order to move enough air to be effective. Hence, you have 2 types of noise, mechanical noise from the motor & wind noise. The situation is worst in air purifiers with HEPA filters because those are so restrictive to air flow, hence some makers like Rainbow & Delphin use water as the main filter + a “L-Lamella” separator cone to reject fine dust. 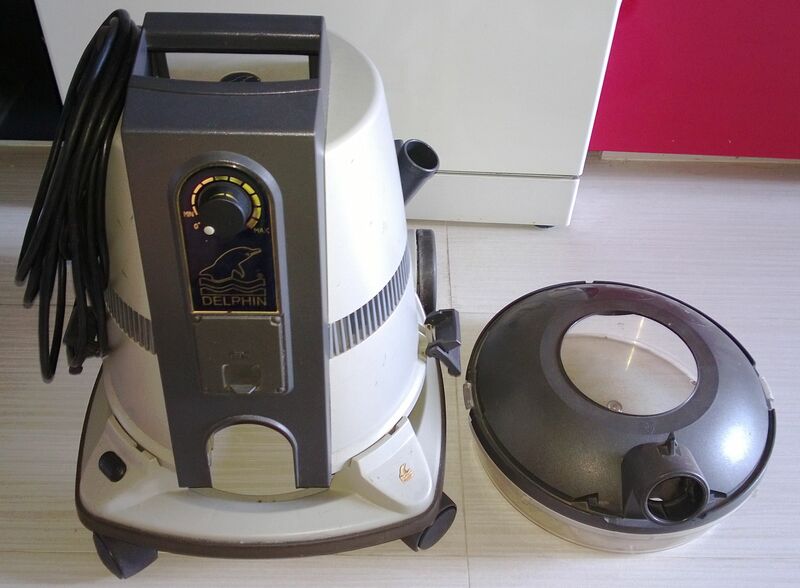 I bought this German made Delphin Vacuum system 10 years ago & it’s still working. However, I rarely use it for air purifying because the wind noise is annoying. Rainbow still include a HEPA filter but this results in the motor having to work very hard & it’s really loud when vacuuming. When purifying air, it’s not as annoying but still noisy. The air flow also doesn’t seem as high as the Delphin. Rainbow Vacuum with HEPA filter. The advantage of water-based system are they’re less restrictive to air flow and thus saves energy + can recycle the air faster. Even if they can’t filter the same amount of dust in 1 cycle, the amount of air they can process in the same amount of time makes up for their lower efficiency. This is especially true for the Delphin system which doesn’t have any membrane filter at all! Water is also able to dissolve much of the harmful chemicals & odour in the air that membrane filters are not able to remove. This is why many air-purifiers also include a charcoal (or activated carbon) filter which adds to the cost of purchase and maintenance. OK fine, I just want to know the cheapest & fastest way to purify my air! Why I’m glad you asked. If you’ve skip the above explanation, that’s fine. I recommend using the air-con as your MAIN air purifier for 2 simple reasons. It’s the most efficient and fastest mover of air in the house, and it’s also very quiet (typically 25dB on Auto). BUT, obviously the filters in your air-con are not actually very good. Some air-cons have UV and Plasma technology. UV kills virus & bacteria so it only sterilize the air, not filter dust. Cold Plasma technology is basically air-ionization, which introduce an electrical charge to dust particles so they can stick to another charged surface. However, this introduce a small amount of ozone which is unhealthy with prolonged inhalation. The charged dust particle must still stick to another opposite charged surface before it’s removed from the air so its efficiency is not consistent in every environment. SO, the best solution is to introduce another filter behind your air-con filter. 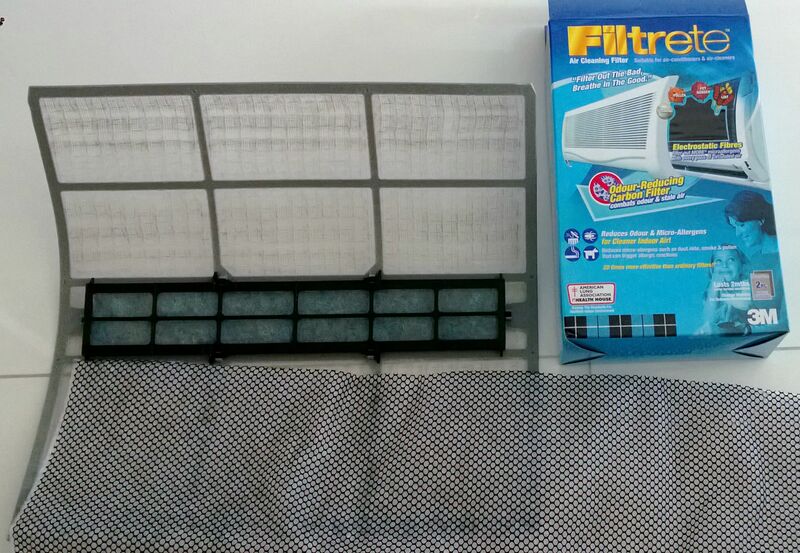 I recommend the 3M Filtrete Room Air Cleaning Filter with Carbon. I bought the blue box Filtrete at a DIY shop for less than $30. It’s an electrically-charged membrane filter with carbon so it’s able to filter particle down to 0.3 micron + the carbon will help to absorb harmful chemicals & odour. It’s not as efficient as a HEPA filter but because the air-con is pushing so much more air through the filter per minute, the result is still very good with noticeably cleaner & neutral smelling air in 10 minutes. The black mesh is the carbon & the membrane filter is behind it. Just cut it to size & stick it or place it behind the normal air-con filter, then reinstall your air-con filter. 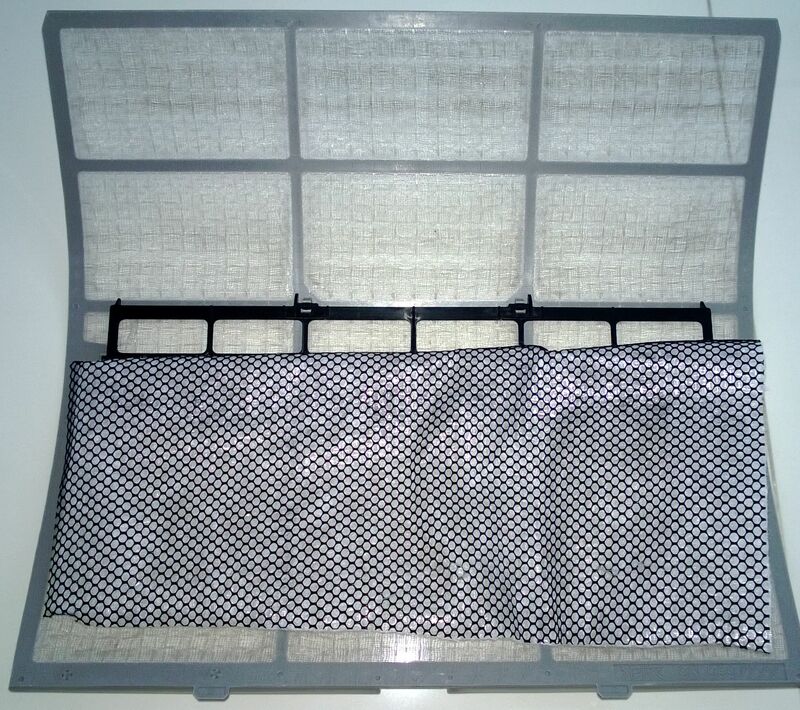 It’s recommended to cover up to 70% of the air-con filter to allow good air-flow so the air-con cooling power is not compromised. Don’t worry, after 1 month, the membrane will turn a icky grey to let you know the filter IS working. The filter is rated to work for 2 months but with this haze, I recommend changing it sooner, when the filter turns completely grey. I install the 3M Filtrete behind the normal air-con filter to prolong its life-span. Each box contains 2 pieces of 60 x 30cm filter, which is enough to last an air-con blower unit 18 months if you change it every 2 months. For less than $30 per air-con unit per year, I’d say that’s VERY cheap!